Harrison et al. 2018. The political biogeography of migratory marine predators. Nature Ecology & Evolution. This isn't a paper that originated in our favorite Santa Cruz, California bar, although, some of the analytical approach did. Rather, this is a love story. Of the ocean. Of science. Of animals. Of migration. Of technology. 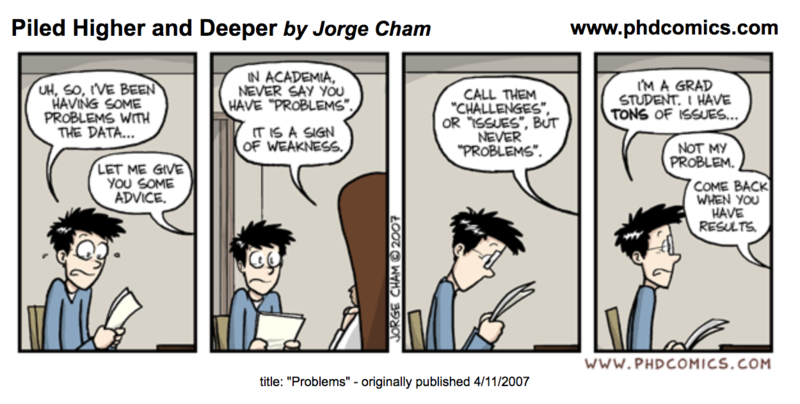 Of data. Of maps. Of international travel. Of human culture. Of the world. I even got hitched to one of my co-authors. Pacific bluefin tuna speed like bullets across ocean basins. Leatherback sea turtles meander around South Pacific islands and then push their ancient shells across the Pacific in a migration that takes about two years round-trip. Sooty shearwaters literally shear across the surface of the Monterey Bay in rivers of birds that flow for hours. Click to watch the amazing sooty shearwater migration off the California coast. Our study, published this week in Nature Ecology & Evolution, was motivated by a need to provide critical information for designing international cooperative agreements for migratory animals in the ocean. Some species, like leatherback turtles and Pacific bluefin tuna, have experienced severe declines and all migratory species face mounting threats, including plastic pollution and noise, overfishing, illegal fishing and incidental catch of non-target species (bycatch). The United Nations General Assembly is meeting now to forge ahead with a treaty for the high seas, and I will be presenting our results during this Intergovernmental Conference. 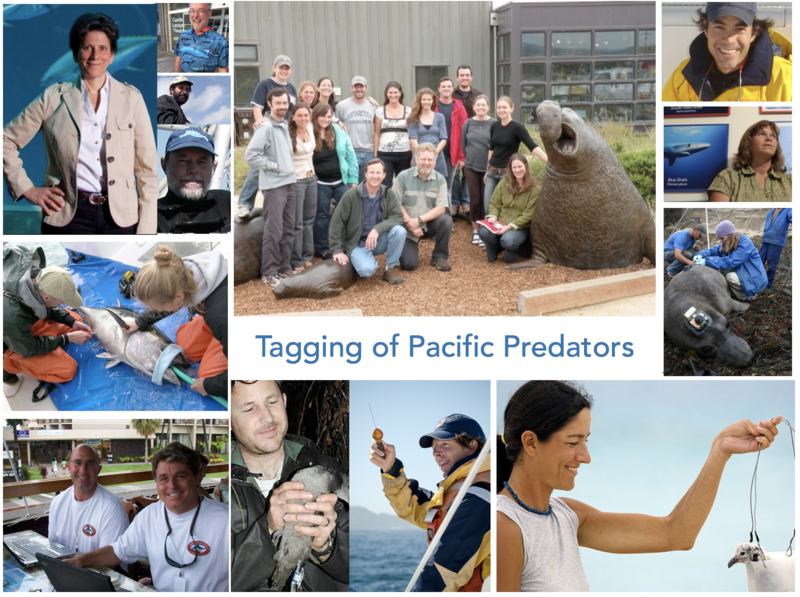 The paper leverages the Tagging of Pacific Predators (TOPP) dataset, the unprecedented animal tracking project in the Pacific Ocean. TOPP was led by Dr. Barbara Block (Stanford University), Dr. Daniel Costa (University of California, Santa Cruz), and Dr. Steven Bograd (NOAA). Over the course of a decade, and as a part of the Census of Marine Life, dozens of TOPP researchers tracked the migrations of 23 species in the Pacific Ocean with electronic tags, producing over 200 papers, culminating in a synthesis in Nature in 2011. I came to the TOPP project as a graduate student in Dan Costa’s lab. When I met Dan I worked for the Society for Conservation Biology after having studied marine ecology at James Cook University. From our first meeting (over Thai at the restaurant downstairs from my office in Washington, D.C.), he deeply supported me exploring questions of conservation relevance with the TOPP dataset. As an added bonus, I received training in Dan's specialty, pinniped biology and physiology. I learned that a “super-weaner” is a pushy, absurdly fat, weanling seal who steals milk from actively nursing mothers. I learned that a rookery of Cape fur seals in a South African diamond mine sounds like a sheep farm. And I learned how to attach and download data from the amazing tracking tags we used to study seal migrations. Scott Shaffer, a TOPP seabird researcher, was a post-doc in our lab at the time (now a Professor At San Jose State University), and his inspiring tale of sooty shearwaters experiencing an “Endless Summer” through their trans-equatorial migration was an early inspiration for me and for this study. Their international travels inspired awe in me, and, a lot of questions. 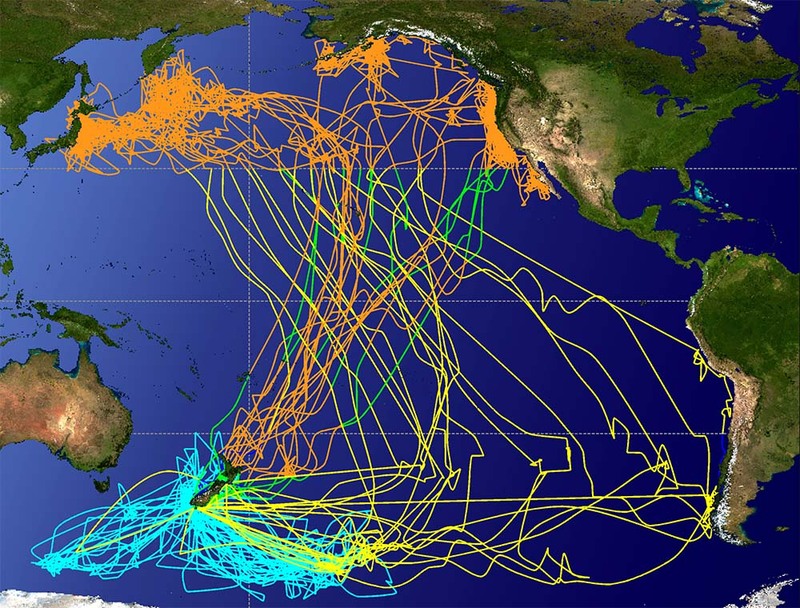 Tracks of 19 sooty shearwaters during breeding (light blue) and subsequent migration pathways (yellow and green, start of migration and northward transit; orange, wintering grounds and southward transit). Image courtesy of Dr. Scott Shaffer and Copyright (2006) National Academy of Sciences, U.S.A. The first questions I had about the TOPP dataset, inspired by the shearwaters, were simple: How many countries do these animals visit? How much time do they spend in each country? And how might these patterns affect each species’ management and conservation? The questions deepened as my understanding of migration ecology advanced. For example, how might the phenology of migration--the mesmerizing to-and-fro of migratory animals throughout the year--relate to geopolitical boundaries, and how might these cycles affect their conservation? This relationship between connectivity throughout the annual cycles of migratory species and conservation is a primary focus of my current research at the Smithsonian Migratory Bird Center, and of our paper. Left: Annual migrations of US and Mexican groups of white sharks from the coast to the White Shark Café in the high seas (and Hawaii). Right: How we represented these annual migrations in a geopolitical context with multinomial models in our paper. While working on these questions, I represented TOPP at an early meeting of the Global Ocean Biodiversity Initiative, an international partnership of 40 organisations committed to advancing the scientific basis for conserving biological diversity in the marine environment. Here I was asked another "simple" question. How much time do TOPP animals spend in the high seas? This question, asked of me directly by those working in the trenches to change global ocean policy to sustain biodiversity beyond national jurisdiction, broadened the scope of the analysis. Large animal tracking datasets have a number of nuances that make their synthesis less than straightforward (you can read all about it in our Supplementary Material and see our code on GitHub). While describing this to co-author and quantitative ecologist (and now husband), Arliss Winship, he said (read this in a James Earl Jones voice): you need a model. And so the work really began. Developing just the right modeling approach to handle the data, while also predicting migratory cycles, uncertainty, and answering questions of conservation relevance, took a bit of time (years)...and for Simon Wood to add a multinomial component to his mgcv R package for generalized additive mixed modeling. My first attempts at this analysis during my dissertation were less elegant, not quite right, and way more work--hundreds of individually fitted binomial models for each species/country combo. I very much appreciate Simon and all of the other R developers out there. Cheers! There are 20 authors on this paper. 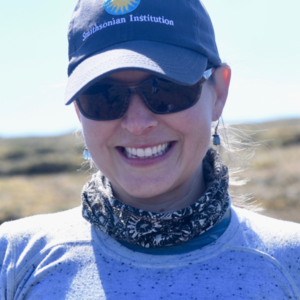 Each species is represented on the author list by a suite of researchers who led the original TOPP field work and provided species-specific expertise in guiding the development of the paper. 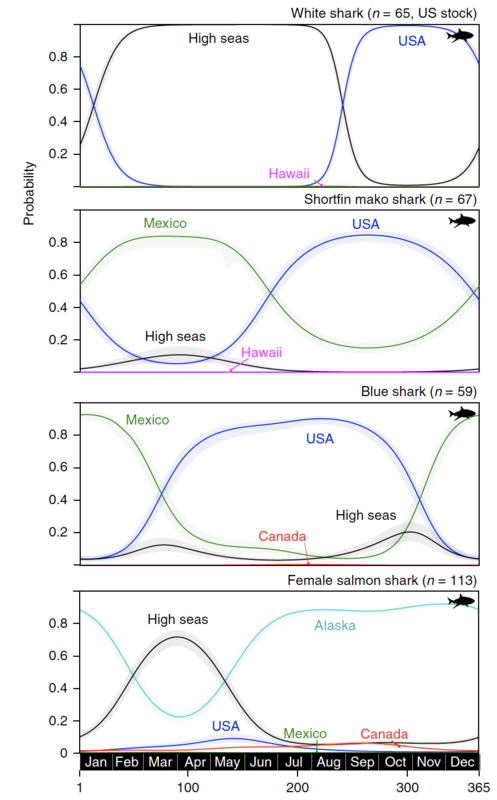 One day I could be on a conference call with the shark team, Aaron Carlisle, Heidi Dewar, Sal Jorgensen, Suzy Kohin, and Kevin Weng, discussing current status assessments and management initiatives for blue sharks, shortfin mako sharks, salmon sharks, and white sharks. The next, I might have received an email from Kristina Gjerde about the upcoming U.N. high seas treaty negotiations. Or hearing from Barb about her recent experiences on a longline fishing boat. Leatherback turtles are a featured case study in our paper due to their extreme international travels (over 32 countries visited), the Pacific populations' Critically Endangered Status, and impacts that span both nesting beaches within countries' jurisdictions, and the high seas. Co-authors Scott Benson and Peter Dutton at NOAA Southwest Fisheries Science Center devoted a lot of time to me and to this paper, but they have devoted their entire careers to saving Pacific leatherbacks. Leatherback life history in the Pacific is fascinating. We had many conversations about NOAA's 5-year priority actions for leatherback turtles and holistic approaches to their conservation.